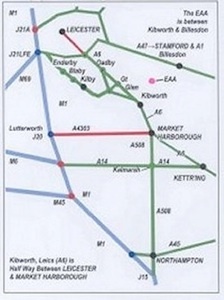 The EAA sits in rural South East Leicestershire in the East Midlands close to the village of Burton Overy (Pink Dot). (signs for KIBWORTH and Burton Overy from Billesdon when heading towards Mkt Harbro from A47). Via Stamford/Uppingham/BILLESDON (A47) same as approach From the North. There is Eurostar to London St Pancras, from where trains can be booked for Market Harborough or Leicester. Taxi service via the A6 takes 15 minutes from Leicester and from Market Harborough train stations. You can email course queries and discuss needs with the EAA founder and tutor Susan T Bird. Please include your clear name, address and phone number, when a brochure and entry form, will be sent. The EAA offers group bookings, or private tuition. If you wish to receive personal home tutorials within a radius of South Leicestershire this can be arranged. Book or Course - By cheque, made out to Susan T. Bird. Upon booking, you will then receive full directions, maps/diagrams and local tourist accommodation with your booking confirmation. Artwork of Any Kind: Childhood inspirations, even your doodles! Paper: No sketch paper or drawing board needed - Paper will be supplied. Drawing Pencils: Solid Graphite, Derwent Sketching 2B/4B. Misc: Rubbers and pencil sharpeners. Own Food: Drinks facilities are provided. Please bring own food. Snacks hot or cold are available upon prior request and will be charged extra. Sensible Shoes & Clothing: For field observation (not during winter months). Your Original Artworks Are Yours! The EAA retains the right to take a copy to aid your progression, or meet whatever your individual needs. - Head Starters is a part day course, and ease anyone into drawing horses. - Level 1 'Fun'*: (One/Two Perspectives/Elevations) bookings of non professional groups may be larger but may choose only one perspective i.e. if booked by groups of up to 10. Enjoy your day especially professional course viewing of separate site horses! No cameras allowed in the studio. Unless taking part not admitted on courses. Course members and any family members part attending must abide at all times sudden changes to any atelier timetable, lesson plan etc and health and safety rules while on the premises. "The Horse in Art and Art in the Horse"